Catering to the folks out their with the long oval shaped heads that get pressure points on the forehead from intermediate oval helmets, the Arai Profile was released to meet their needs. 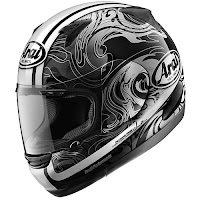 Packing the same qualities and feature set of Arai's other motorcycle helmets, the Arai Profile Helmet is the solution to the long-suffering masses who experience head pain every time they ride. 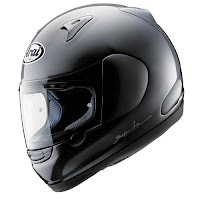 The vast majority of motorcycle helmets on the market are either globe-shaped (think HJC) or medium-oval (Shoei, Scorpion, etc). Arai saw a glaring need for the rider who doesn't fit these helmets. Out came the Arai Profile. 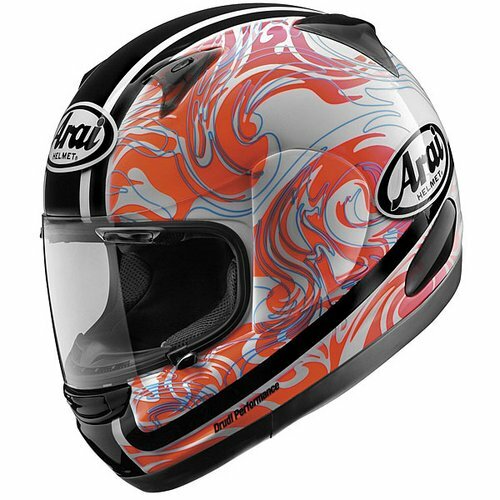 The shell is Arai's Complex Laminate Construction which is a fiberglass composite that is strong and light, allowing the use of softer, less-dense liner fabrics for excellent comfort. The dual intake & dual exhaust ventilation system flows a ton of air when riding in a medium upright position, keeping your head cool and dry. The brow ventilation system flows cool air to the upper face area with vents at the upper faceshield, without compromising the strength or protective elements of the helmet. Arai has become known for the quality of these small details. The liner is antimicrobial and anti-bacterial, fully removable and washable as well as the cheekpads. The removable breath guard and chin curtain help to prevent fogging by deflecting breath away from the shield. This helmet is a great choice for the guy who has yet to find the helmet that fits his long, narrow head. It meets or exceeds DOT and Snell 2005 standards and provides a super quiet and comfortable ride. Available in eight solids and four graphics. Check out our full selection of motorcycle helmets at RevZilla.com.